Right Drainboard Eagle Group 314-24-4-24 Four Compartment Stainless Steel Commercial Sink with One Drainboard - 130 3/4"
Soak, wash, rinse and sanitize your dishes simultaneously with the Eagle Group 314-24-4-24 four compartment pot-washing sink, which features a drainboard for drying! Made of 16-gauge type 304 stainless steel, this sink is durably made to last through years of high-volume use. The four 1 5/8" galvanized steel legs are made with front-to-back cross bracing and 1" high impact plastic adjustable feet for stability. A 9 1/2" backsplash comes standard to help protect your walls! Its tiled edge makes it easy to install and two sets of holes are punched on 8" centers to accommodate two faucets (sold separately). The front and side edges of this four compartment sink feature 1 1/4" rolled edging to help contain spills and overflow that happen with everyday use. The quad set of 24" x 24" compartments feature coved corners for easy cleaning and optimal drainage, while the 13 1/2" bowl depth will hold plenty of dishes, pots and pans! Its single 24" drainboard is V-creased to ensure that your air-drying dishware won't leave puddles! 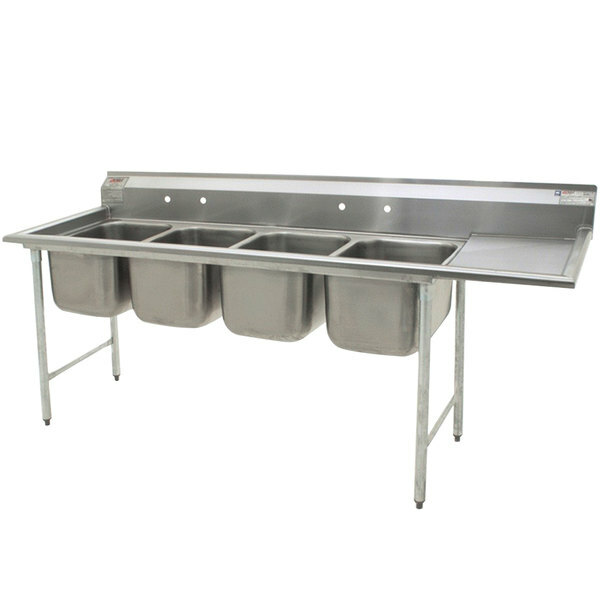 Left to Right: 130 3/4"
Eagle Group 314-24-4-24 Four Compartment Stainless Steel Commercial Sink with One Drainboard - 130 3/4"
Advance Tabco 94-24-80-18 Spec Line Four Compartment Pot Sink with One Drainboard - 111"
Advance Tabco 94-4-72-18 Spec Line Four Compartment Pot Sink with One Drainboard - 95"
Advance Tabco 94-64-72-18 Spec Line Four Compartment Pot Sink with One Drainboard - 103"